Hemophilia is the most common inherited bleeding disorder. Hemophilic patients should be cosidered as special patients. There is no contraindication to general dental treatment for hemophiliacs, as they generally do not involve bleeding. But caution must be used with any surgical procedures that involve the local and general anesthesia. Such patients should always be managed in the setting of specialized units with appropriate clinical expertise and laboratory support. Recent advances in the management of hemophilia have enabled many hemophiliac patients to receive surgical dental procedures in an outpatient dental care on a routine basis. 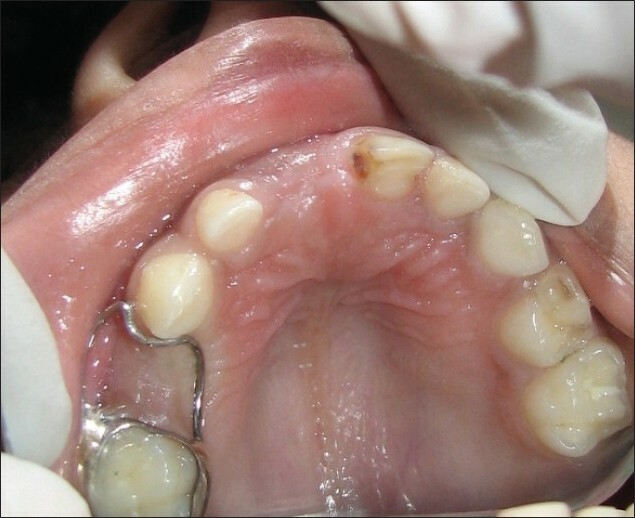 The purpose of this case report is to provide a few management strategies when providing full mouth rehabilitation under anesthesia and replacement therapies that are available. In addition, overviews of possible complication that may be encountered when providing such treatment are discussed here. Among the congenital coagulation defects, hemophilia A, hemophilia B (Christmas disease), and von Willebrand's disease are the most common. Hemophilia is an X-linked disorder with a frequency of about one in 10 000 births. Hemophilia is caused by a deficiency of coagulation factor VIII (hemophilia A) or factor IX (hemophilia B) related to mutations of the clotting factor gene. Although a case of female hemophilia has been reported by Gilchrist in 1961, it manifest only in males. Hemophilia A is more common than hemophilia B, representing 80 to 85% of the total population. Many countries have started to establish care for hemophilia, even though they do not have standard protocols to ensure the proper management of hemophilia. Oral healthcare providers must be aware of the impact of bleeding disorders. In hemophiliacs, even the routine dental treatment like extraction can produce a life-threatening situation; hence, they must be given special importance. Hence, these patients are best accomplished both efficiently and effectively only by the practitioners who are knowledgeable about the pathology, complications, prophylactic, restorative, and surgical dental treatment options associated with these conditions. A 4-year-old boy came along with the parents to the exclusive child specialty dental center with the complaints of pain in the right upper back tooth region. His parents gave the history of swelling in right upper jaw region for past two days. Medical history revealed that at the age of 3 years, he had prolonged and uncontrolled bleeding after a fall, following which the patient was diagnosed with hemophilia A. There was no history of factor transfusion at that time. Family history yielded no relevant details. There was no other significant history of any medical disorder or exposure to anesthesia or surgical intervention. In clinical examination, following findings were noted: 51 - root stump, 54 - dentoalveolar abscess, 74 - deep dental caries, 61,62,64,75,84,85 - moderate dental caries, 73,72 - initial dental caries. Based on the clinical findings, the treatment plan was designed. Considering the age of the patient, complexity of the treatment, and complication in the coagulation, it was decided to carry on the treatment under general anesthesia. The consent from medical, hematological, and anesthetical care centers was obtained before the treatment. The patient was scheduled for full mouth rehabilitation and put under chlorhexidine mouthwash for a week, to enhance the oral hygiene prior to the procedure. Preanesthetic investigation values were as follows: hemoglobin - 12.5 gm%, prothrombin time -13 seconds, and activated partial thromboplastin time (aPTT) - 39.88 seconds. Factor VIII concentration was found to be 25% of normal activity. For the procedures, an 18 G intravenous cannula was inserted. Based on the discussion with the hematologist, it was decided to go for the factor VIII transfusion, in which 200 Units as a preoperative loading dose by slow infusion, half an hour prior to treatment and 200 Units as a maintenance dose 12 hours postoperative was done. Infiltration was done by slow intravenous infusion. The following treatments were done for the patient by quadrant dentistry. In the Second Quadrant, 61, 62, 64, 65 were restored with composite after complete caries removal and pulp protection. In the third quadrant, composite restoration was done in 75. In 74, pulpectomy followed by stainless steel crown was given. During the pulpectomy, care was taken to avoid over instrumentation in periapical region. And stainless steel crown was placed with smooth margin without impinging the gingival sulcus [Figure 1] and [Figure 2]. 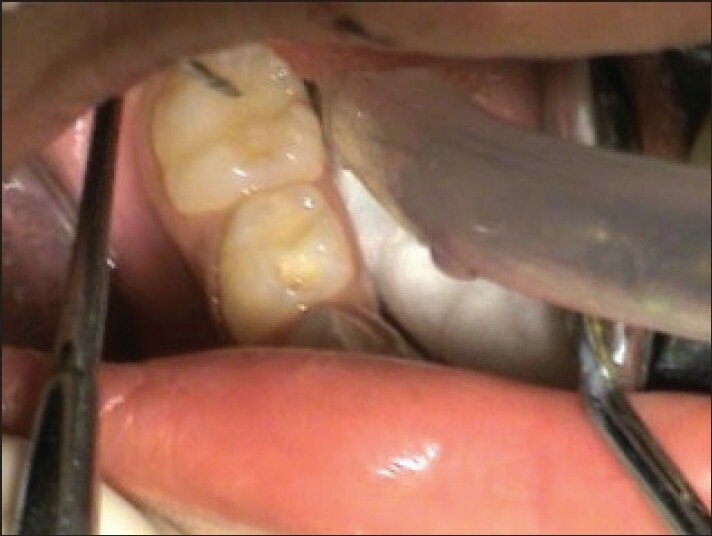 The interdental carious lesions in the gingival margins of 73 and 72 were left out from extensive cavity preparation, as it may induce a gingival bleeding. Spoon excavator was used to remove the caries and fluoride varnish (Flourprotector R ) was given to avoid further demineralization. In the fourth quadrant 84 and 85, composite restorations were done [Figure 3] and [Figure 4]. In the first quadrant, 51 was extracted atraumatically [Figure 5]. 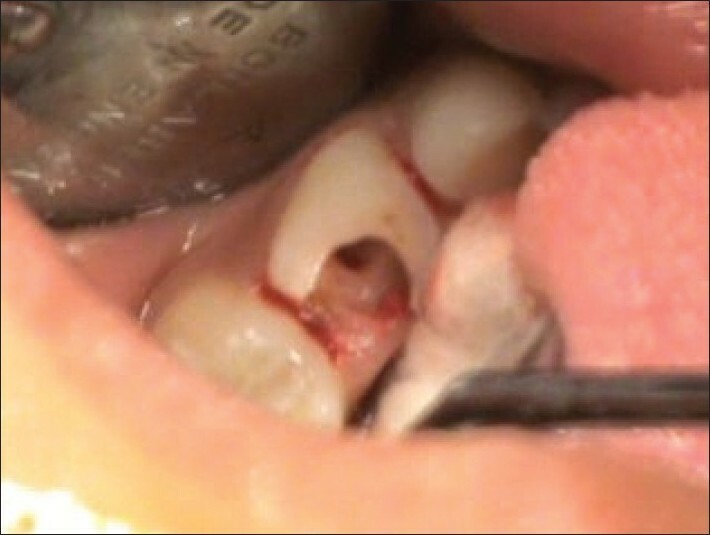 The presence of mobility and intraoral sinus made us [Figure 6] to opt for extraction, rather than pulpectomy in 54. 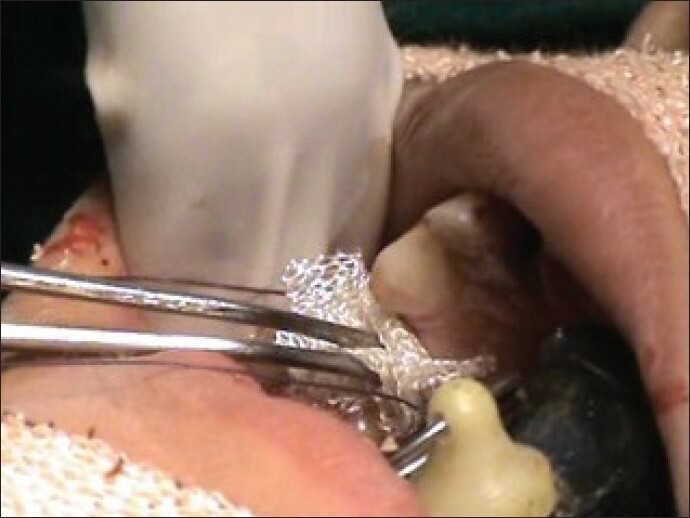 Care was taken to remove the granulation tissue underneath the socket which may prolong the bleeding. After extraction, the sockets were irrigated with metronidazole thoroughly and local pressure was applied. As the bleeding was continuous, the sockets were packed with Surgicel* (Oxidized Cellulose, Johnson and Johnson Co, India. ), as suggested by Gupta et al. [Figure 7]. Then, resorbable sutures were placed using vicryl 4-0 and nontraumatic needles. During the entire procedure, complete isolation was made by the saliva ejector by resting it on a moist condensed sterile cotton roll in the floor of the mouth. The vital parameters were well maintained throughout the procedure. Postoperatively, factor VIII was infused to the patient, twelve hours after the procedure, as per the guidelines of hematologist. Patient was admitted in the intensive care unit and vital signs were closely monitored. Twelve hours postoperatively, slim bleeding was noticed around the stainless steel crown margin. It was controlled by the local placement of Surgicel® . Twenty-four hours postoperatively, slight extrusion of Surgicel was found from the extracted socket, which was removed carefully. After the consent from the pediatrician, the patient was discharged. After a week during the review, band and loop space maintainer was given for 54 [Figure 8]. A prolonged aPTT will be seen in severe and moderate cases but may not show prolongation in mild hemophilia. A definite diagnosis can be made based on FVIII or FIX factor assay. In the evaluation and treatment of hemophiliacs, the psychosocial aspect should never be underestimated. As there are some reports that the emotional disturbance is a contributing cause of spontaneous hemorrhage in hemophiliacs,  the dentist must be alert to the emotional problems of the young hemophiliac as well as to the over-concern of the mother. If bleeding starts or is expected to start, Factor VIII must be replaced to a level adequate to ensure hemostasis. Though the heat and chemical treatment of blood products began in 1986,  still plasma (fresh or frozen), cryoprecipitate, or fractionated human factor concentrates obtained from pooled blood sources carry the risk of transmitting blood-borne pathogens like hepatitis virus or HIV. At present, replacement of missing factor is commonly achieved with porcine Factor VIII or recombinant Factor VIII. One unit of Factor VIII concentrate per kilogram of body weight elevates the Factor VIII level by 2%. The amount of factor VIII to be infused was discussed and decided with the hematologist. After induction of anesthesia, extra care should be taken while intubation of the airway as it can cause submucosal hemorrhages, which can prove life threatening. Nasal intubation was avoided, as it can prove traumatic and bleeding from the site can lead to aspiration. Care was taken during positioning of the extremities and pressure points were padded to prevent intramuscular hematomas or hemarthrosis. It is important to consider the local measures to minimize the risk of postoperative bleeding. According to authors,  suturing is desirable to stabilize gum flaps and to prevent postoperative disturbance of wounds by tongue movements. But, Brewer  reported in a small series where sutures were not used routinely and there was no significant increase in postextraction hemorrhage. It must be decided, based on the age of the patient, number of teeth and severity of the wound. Resorbable and nonresorbable sutures may be used at the operator's discretion. In this case, resorbable sutures were used, as it avoids need for the postoperative removal  and the possibility of bleeding when the suture is removed. A nontraumatic needle was used and the number of sutures minimized as suggested by Shoa. According to Kumar et al. vicryl sutures are preferred and catgut is best avoided. If a nonresorbable suture such as black silk is used, it should be removed within four to seven days. The local hemostatic measures recommended are Surgicel® , Oxidized cellulose, and fibrin glue. Tranexamic acid, collagen, cyanoacrylate, and fibrin glues can also be helpful. Local use of fibrin glue and swish and swallow rinse of tranexamic acid before and after the procedure is also suggested as a cost-effective alternative. Based on the previous discussions with hematologist, we opted out for Surgicel R .Some authors recommended soft vacuum-formed splints to provide local protection following a dental extraction or prolonged postextraction bleed. But, Kumar et al. stated that packing of surgical site is usually unnecessary if replacements have been sufficient. Acrylic protective splints can be more troublesome than helpful by accumulating debris within them which results in sepsis. As our patient was too young to maintain the splint sterile, it was decided to avoid the splint. Preventive and restorative dentistry are of particular importance to the hemophiliac since early dental treatment minimizes the need for later oral surgery. Every restoration in a hemophiliac eliminates a potential extraction. The dentist need not compromise the standard of dental service because the patient is a hemophiliac. Poor dentistry does not prevent complications, it merely aggravates them. Powel et al. stated that certain precautions taken during restorative treatment greatly reduced the hazard of excessive bleeding. Isolation with rubber dam provides gingival retraction, improved visibility, and minimizes the laceration of the buccal mucosa and lips. Soft tissue trauma must be avoided as much as possible and a matrix band may help to avoid gingival laceration. 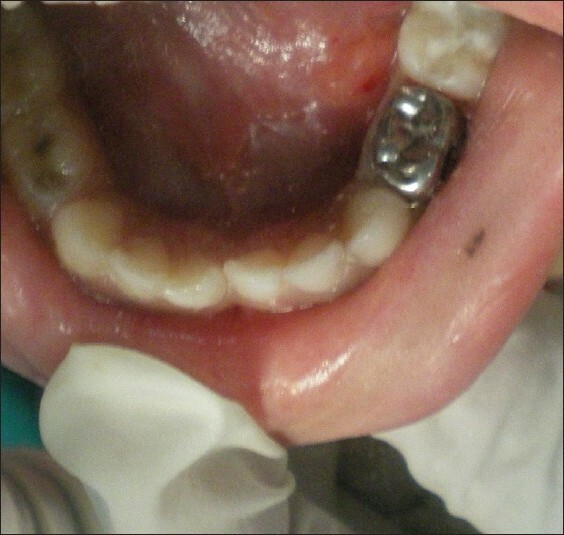 In this case, as the treatment was done under oral intubation, rubber dam was not used. But, extra care was taken to protect the tongue, buccal mucosa, and lips. Conservative extensions of gingival margins were prepared, as it will ease the concern of soft tissue injury. Wet cotton rolls were placed to reduce mucosal bleeding. If extraction is indicated, the possibility of conventional endodontic treatment must also be considered. As per the literatures, endodontic treatment generally is of low risk to hemophiliacs. But the instrument reach beyond the periapical foramen should be avoided. It is important that the procedure be carried out carefully with the working length of the root canal calculated, to ensure that the instruments do not pass through the apex of the root canal, which was followed in our case. As suggested by many authors, the pulpal treatment was followed with the stainless steel crown. Osamu Chiono  quoted that the possible dental complications in hemophiliacs include postsurgical hemorrhage, periodontal bleeding secondary to placement of stainless steel crowns, and hemorrhage due to trauma to the soft tissues. 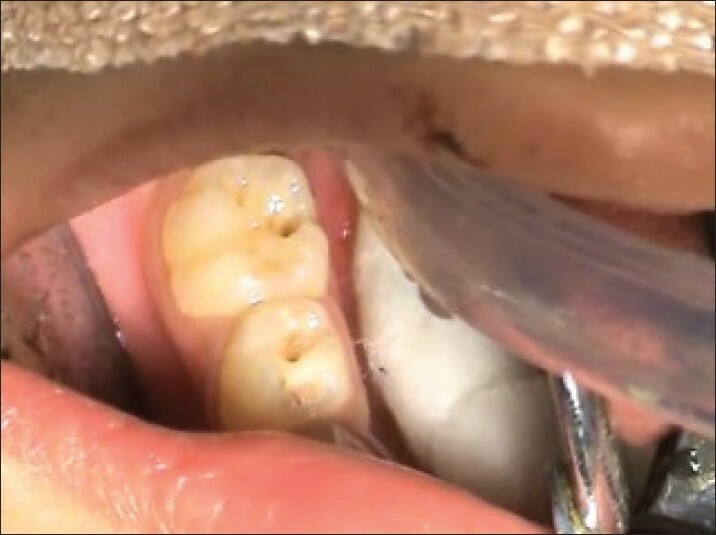 Even though the care was taken to maintain the smooth margins of SSC, slight periodontal bleeding secondary to placement of stainless steel crowns was noticed. It was controlled by local hemostatic agents Surgicel. For the band and loop space maintainer, band was placed supragingivaly and was ensured that it was not impinging the gingiva. Postoperatively, a diet of cold liquid or semisolid food should be advised to take for five to ten days. Care was taken to watch for hematoma formation manifesting as dysphagia, swelling, or hoarseness. Postoperative antibiotics were advised as this will reduce the late bleeding which is due to the infection. As Non-Steroidal Anti-inflammatory Drug (NSAID) can aggravate the bleeding tendency,  the safer alternatives like acetaminophen was preferred. Postoperative care also involves the use of chlorhexidine gluconate, an antibacterial mouthwash. Usually, mouthwash is advised for 30 to 60 seconds twice a day; as the patient was preschool child, his parents were advised to wipe oral cavity with gauze soaked with chlorhexidine. Dental care under general anesthesia for the special children with bleeding disorders like hemophiliacs needs a complete coordination of the parents, Pediatrician, Hematologist, Anesthetist, and the Pediatric dentist, with the ultimate focus on the child. So, keeping the special child in the center, the "Kidznteenz Pediatric Pentagon" [Figure 9] can be drawn to represent the above conclusion. This will ensure the effective and efficient management of the special child with the bleeding disorder. Hematologist is involved in this pediatric pentagon for a special child with bleeding disorder. In similiar instances a special child with other systemic problems will involve the co-ordination of the concerned speciality person to provide the necessary scientific advice to handle that particular situation pertaining to pediatric dentistry. Simultaneously, the pediatric dentist and physician should choose the least traumatic course of management affording the minimum amount of risk. Finally, the circumstances must be carefully controlled and the procedure should be carried out in the least traumatic way possible. The authors acknowledge Dr.Vijailakshmi Acharya M.D.S, for providing the needed technical and scientific support to carry out the treatment successfully. 1. Brewer A. Dental management of patients with inhibitors to factor viii or factor ix. Available from: http://www.wfh.org/2/docs/.../dental_care/toh-45_dental-inhibitors.pdf . [Last Accessed on 2010 June 10]. 2. Israels S, Schwetz N, Boyar R, McNicol A. 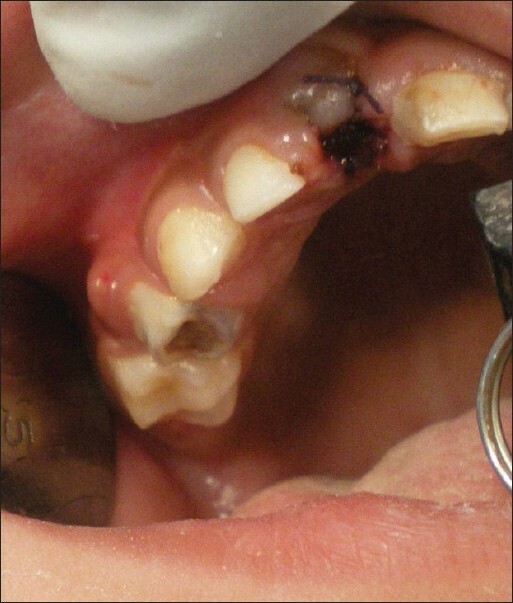 Bleeding disorders: Characterization, dental considerations and managements. J Can Dent Assoc 2006; 72:827. 3. Kumar JN, Kumar RA, Varadarajan R, Sharma N. Specialty dentistry for the hemophiliac: Is there a protocol in place? Indian J Dent Res 2007:18:48-54. 4. Gupta A, Epstein JB, Cabay RJ. Bleeding disorders of importance in dental care and related patient management. J Can Dent Assoc 2007; 73:77-83. 6. World Federation of Hemophilia. Guidelines for the management of hemophilia world federation of hemophilia. Available from: http://www.ehc.eu/fileadmin/dokumente/gudelines_mng_hemophilia.pdf . [Last Accessed on 2010 June 10]. 7. Osamu Chiono. Dental anesthesia for the hemophilic patient. Anesth Prog 1968; 15:295-8. 8. The haemophilia society. Available from: http://www.haemophilia.org.uk?content_id=87andparent=278 . [Last Accessed on 2010 June 10]. 9. Scully C, Watt-Smith P, Dios RD, Giangrande PL. Complications in HIV-infected and non-HIV infected haemophiliacs and other patients after oral surgery. Int J Oral Maxillofac Surg 2002; 31:634-40. 10. 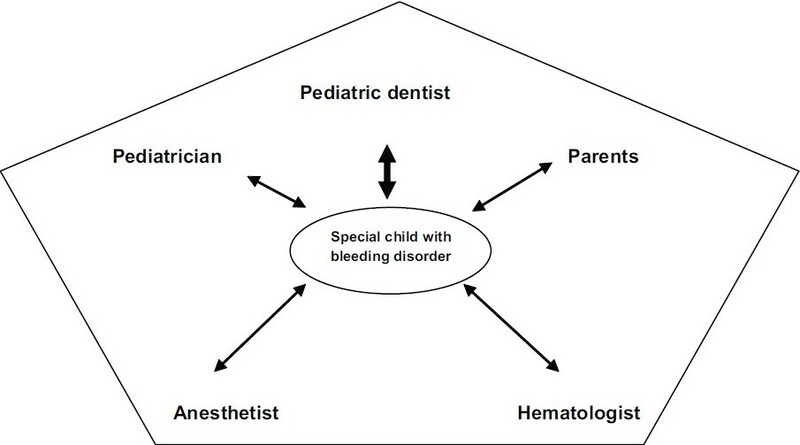 Brewer A, Correa ME .Guidelines for dental treatment of patients with inherited bleeding disorders. Available from: http://www.wfh.org/2/docs/Publications/Dental_Care/TOH-40_Dental_treatment.pdf . [Last Accessed on 2010 June 10]. 11. Jover-Cerveró A, Poveda-Roda R, Bagán JV, Jiménez-Soriano Y. Dental treatment of patients with coagulation factor alterations: An update. Med Oral Patol Oral Cir Bucal 2007; 12:E380-7. 12. Shoa DN. Apicoectomy on a hemophiliac performed in the dental office with home care to prevent bleeding. J Mich Dent Assoc 1980; 62:405-6. 13. Powell D, Bartle J. The hemophiliac: Prevention is the key. Dent Hyg (Chic) 1974; 48:214-9. 14. Evans BE, Aledort LM. Hemophilia and dental treatment, J Am Dent Assoc 1978;96:827-34.